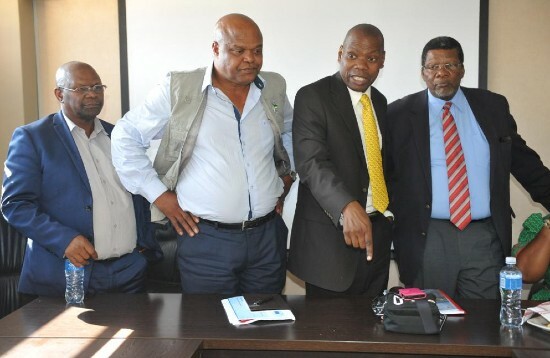 The Minister of Cooperative Governance and Traditional Affairs, Dr Zwelini Mkhize, the Minister of Water and Sanitation, Mr Gugile Nkwinti, Deputy Minister Mr Obed Bapela, Premier of the Free State – Mrs Sisi Ntombela, MEC of Cogta – Mr Oupa Khoabane, MEC of Roads and Transport – Mr Sam Mashinini, Member of Parliament – Mr David Mahlobo, visited the municipality of Maluti a Phofung on the 03 April 2019. The purpose of the Ministerial visit was prompted by the lack of water and communities have made this known through protests. The visit was also meant to assess progress done in the implementation of the section 139 intervention and engage with various stakeholders such as councillors and political parties in Council, Traditional Leaders, communities and consider additional measures to strengthen and address immediate service delivery challenges, particularly challenges because people do not have water. Other challenges are the water leaks, inconsistent electricity supply, and sewer spillages, roads, etc. The Municipality of Maluti a Phofung has been experiencing political instability, poor delivery of services, maladministration, high levels of corruption, poor financial management and high levels of debt owed to Eskom and other creditors. The Provincial Government invoked Section 139 (1) (b) of the Constitution in February 2018 due to municipal failure to perform its Constitutional and Legislative obligations as it relates to their core responsibilities to communities and good governance. Despite the secondment of an Administrator, Acting Municipal Manager, Human resource specialist, Acting CEO of MAPWATER, limited progress has been registered in stabilization of the administration, in terms putting systems and processes to strengthen performance management, financial management and service delivery. Former Municipal Manager of Westonaria Local Municipality and former Administrator of Ditsobotla local municipality. Professional Engineer, 15 years experience in municipalities, previously worked at Maluti a Phofung as a PMU Manager, Nketwane as a manager water and Sanitation. Former CFO of Mogale City who brings extensive experience on financial management in local government. Furthermore, the municipality will utilise the framework contracts available in MISA and Free State Provincial Government, including service providers that specialize in Auditing, Financial Management, Supply Chain Management systems and processes. The Minister and the Provincial Leadership have thanked the administrator and the acting municipal manager for the sterling work they have performed under difficult circumstances. Mmakwane 5577 Electrical and mechanical equipment failures Replacement and repairs of the electro mechanical – pumps and valves.